Stroll through any “girlswear” department and you’ll see clothing that’s dramatically different to that on offer for boys. Shorts are shorter. T-shirts are tighter and higher. Sleeves cropped. Prints very often based on perceived gender stereotypes and colour palates predictably pink, sparkly or pastel. Sharon Choksi, mum and co-founder of US kids’ label Girls Will Be noticed this and decided to take action. She developed her own line of practical and comfy clothing for girls who wanted their clothes to reflect them and better prepare them for busy kiddo life. It was 2013, and after relentlessly trying to find great looking clothing that suited Maya and Grace’s busy kiddo lifestyles, Sharon and her brother and sister took matters into their own hands Girls Will Be was born. Their label aimed to sweep comfort, fun and fashion up into their range and provide a better choice for non-bows-and-ruffles girls. “We want girls to feel inspired, confident, and ready for anything when they put on our clothes,” Girls Will Be say in their mission statement. The Girls Will Be range is ethically made in the US, and comes in a range of colours (even pink and purple!) but with a more kid-friendly, play-ready fit in mind. Babies, kids and adults are all catered to, with styles focusing on animals, science, sport, art and inspirational phrases amongst the very excellent range. As part of her brand development, Sharon looked at ten leading childrenswear labels in April of this year. She found some alarming overall style differences that will have you wondering what’s really going on with the way we dress little girls. The inner leg seam on shorts marketed at girls was 65 percent shorter than the inner seam on boys shorts. Girls shirt sleeves were 35 percent shorter than boys shirt sleeves. The length of girls shirts was 8 percent shorter than boys shirts. Girls shirts were between one and three inches skinnier than boys shirts. 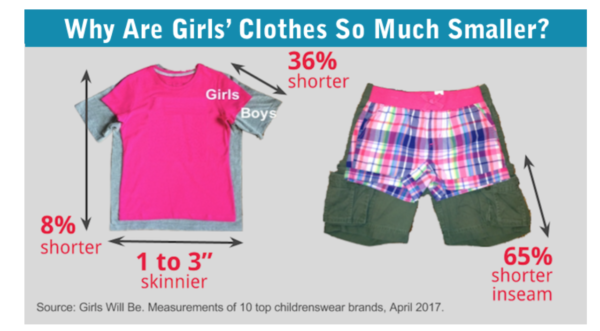 Basically, the clothing marketed at girls was shorter, tighter and more body revealing than the clothing marketed at boys. While some say this is because boys are BIGGER than girls, this is actually not true. Girls are often taller than boys until around the age of 9, when puberty begins to kick in. It’s all pretty messed up. Before you wonder why we’re celebrating a girl-focused label that’s doing things differently, know that we are considering boys too. Granted, not all boys want to wear cargo shorts and camo tees with truck print detail. Some might be desperately seeking purple leggings or comfy nighties to snuggle down in. However, these different-boy preferences are more about identity, fashion, comfort and preference. Girls Will Be are mindful of those, but are ALSO offering a valuable alternative to a potentially sexualising trend aimed purely at girls, however. That makes it extra important, we think. Fantastic work, Sharon and family!